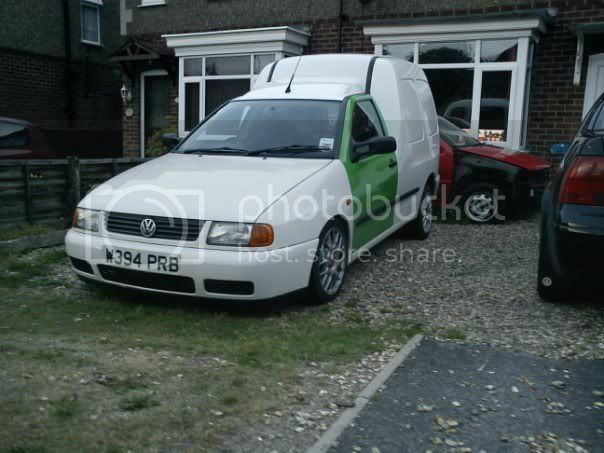 I have wanted a caddy van for a few years now since my mate had a matt black VR6 one. I was trying to save for a TDi but when my old KA failed it's MOT I got rid of it and found this. One owner from new (Nottingham council) 126,000 miles. 1.9 SDi. It was on 13" steel wheels when I got it. One of the first mods I did was fit my VR6 seats from my golf. Next was wheels. I took the TSW's off my mk3 Golf. I was not planning on fitting them until I lowered it but I couldn't help my self. I have another set of wheels for it once they have had a re furb. I had a play with them to see what kind of finish I might like. 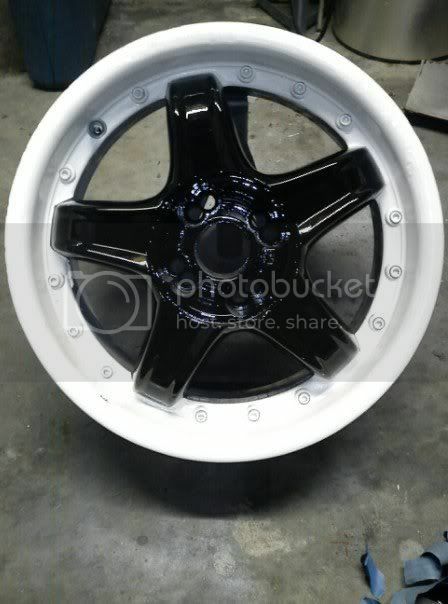 They need acid dipping and re painting oh and longer wheel bolts. 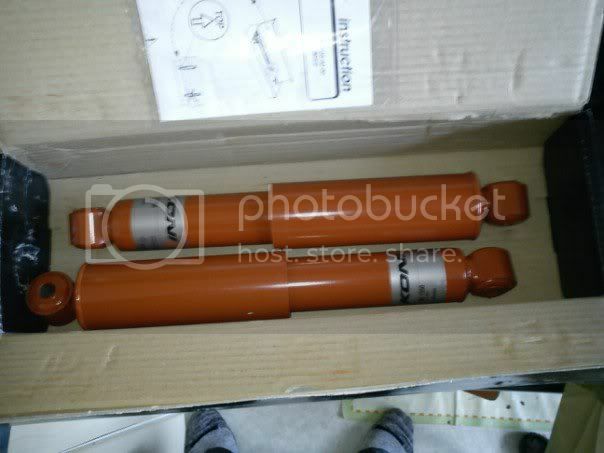 I was going to get some Spax psx adjustable rear shocks for it but didn't have much look getting information on them so I got these. I have JOM coilovers on the front. I finally got the van lowered about 2 weeks ago. I thought the axle flip was supposed to take about 2 hours? 6 hours later Rob and I finally got it done. lol. At the end of a long day it looked like this. The first drive home it was scraping the plastic undertray everywhere. It was 1" from the floor so the next weekend I removed it and lifted the front mount with a hockey puck. I'v now got about 3" clearance on the sump. I was hoping to get my black dash this week but I'v not heard from my mate who is sorting it for me. I hope to get and fit black dash, polo 6n rear door handles, 6n electric mirrors (already have these), re spray, colour yet to be confirmed, re furb my 16" wheels and TDi it. Most of this will have to wait a while as my wife and I are having a baby next month. 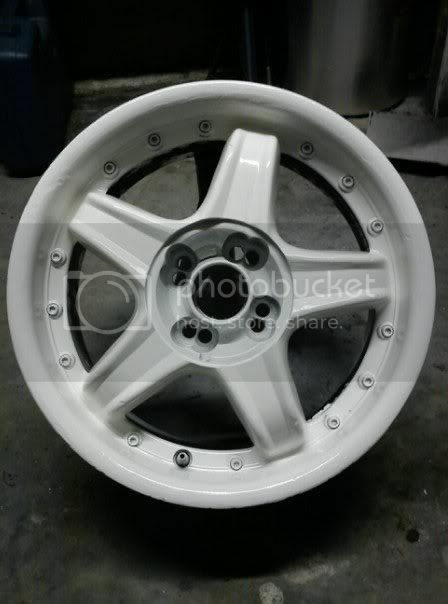 Have the wheels you've been playing with been redrilled? theres not much meat between the bolt holes is there?!! No not been re drilled thats how they came. 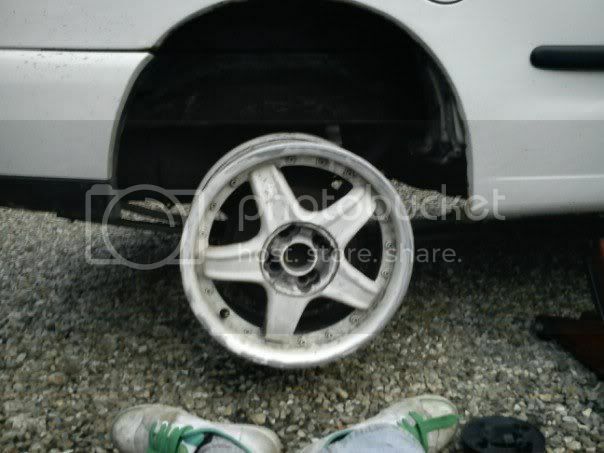 They were fitted to a 6n polo for a few years before I got them for £50 with tyres. It was on 13" steel wheels when I got it. 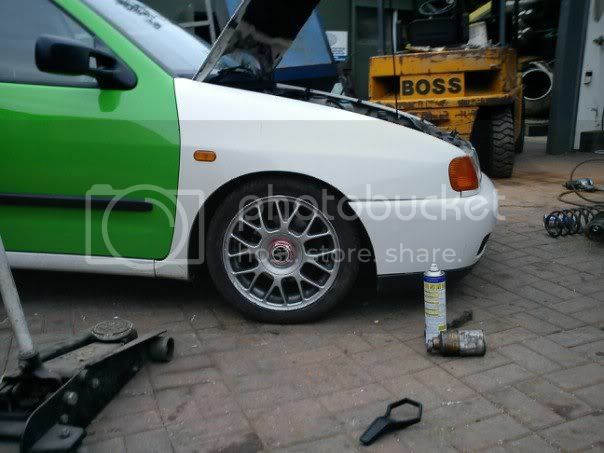 Might have been 14" actually, think it was 13"'s I put on the Golf when I robbed it of it's alloys. Well still no more news on my black dash. It was supposed to be with me this week. I'v done a few small bit to the van the last couple of weeks. Fitted a tinted interior light from my 6n, fixed a few little niggles. I do have a knocking I'm guessing the exhaust. Mainly does it on LH bends. I jacked the back up and shook the exhaust as hard as I could but could not manage to get it to make a noise so not really sure what it is. I realigned my gear linkage which has tightned the gears up no end but now I find 1st and 2nd a bit tight, just got to get used to where they are I guess? 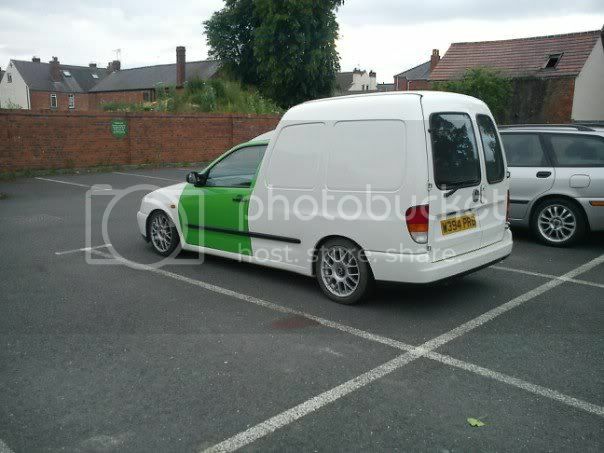 The knock was there before I lowered the rear so that is why I am a bit stumped. I could understand if it started after lowering the back. I do worry about the sump. If I crack it I can weld it but it's just a pain and a hassle to have to do. 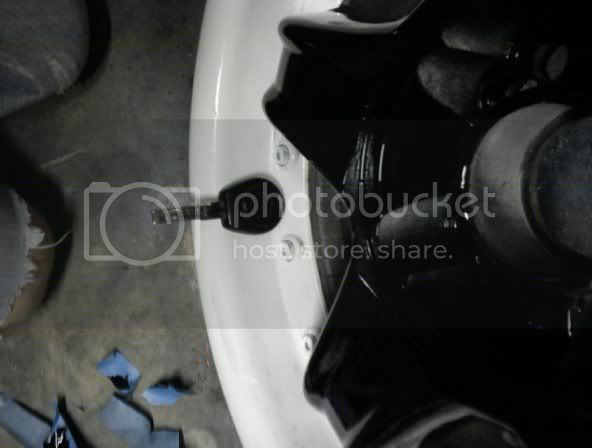 i ended up getting a steel/alloy sump and changing the engine mounts for VR6 ones. which stops the "bounce" which seems to make the problem worse. I'v already got one of them tools, thats what I used to do it. So you changed all the engine mounts for VR6 ones? What is the difference in them then? Where did you get your steel/alloy sump? What sort of clearance do you have on your sump/how low are you? 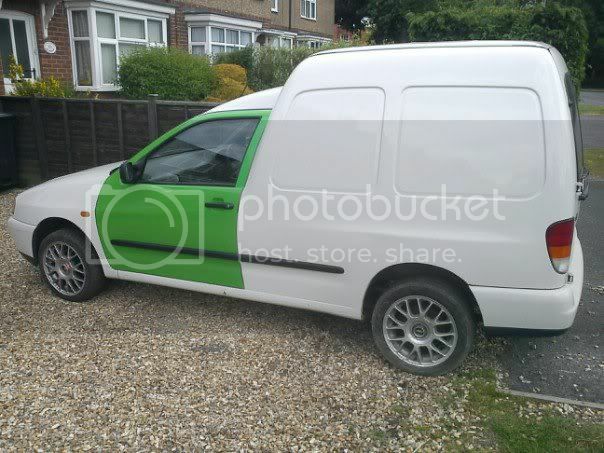 Does any one know where I can get coloured seat belts from for my van? I'm looking at maybe getting some red ones and how easy are they to change? 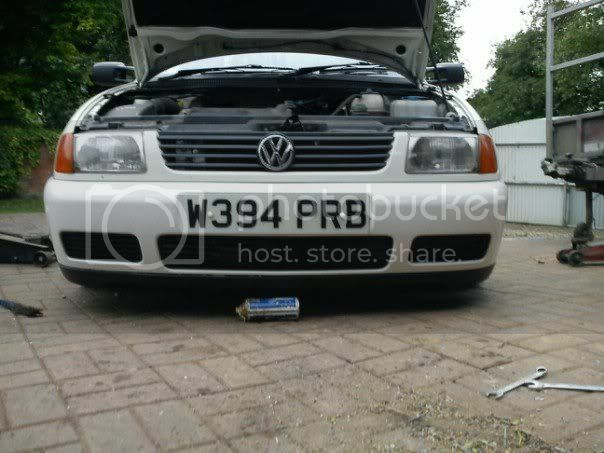 Also 1.9 TDi tuning. I have heard of people using the PD 130 turbo but what sort of adapter do you have to use? I have tried to search for information about tuning this engine but to be honest some of it is a bit too technical for me to understand. I could really do with a list of all things that I can do. .216 injectors, wheres the best place to look for them as I se you got yours from someone on hear?